The global stockpile of nuclear weapons is down from an all-time high of about 64,000 in 1986 - but some contemporary weapons are about 300 times more powerful than the bomb dropped on Hiroshima. The US believes this missile is dual-use and has been tested to distances "well over" 500km (310 miles). Capable of travelling more than 2,500km (1,553 miles), it appears to be the world's longest range dual-use missile capable of a precision strike. It is difficult to know whether it would choose this course of action - or wait until the weapons had detonated and it became clear how they were armed. In practice, the greatest danger with dual-use missiles may lie elsewhere: misidentification before they have even been launched. Imagine that China dispersed lorry-mounted DF-26 missiles loaded with nuclear warheads around its territory. The US, wrongly believing them to be conventionally armed, might decide to try to destroy them. By attacking them, it could inadvertently provoke China into launching those nuclear weapons it still had before they could be destroyed. Dual-use missiles are not the only way in which nuclear and non-nuclear weapons are increasingly entangled. For example, all nuclear forces need a communication system - which could include satellites. But, increasingly, these nuclear command-and-control systems are also being used to support non-nuclear operations. The US, for example, operates satellites to provide warning of attacks with nuclear-armed or conventionally armed ballistic missiles. In a conflict between Nato and Russia, these could be used to detect short-range conventional ballistic missiles launched by Russia - as the first step towards shooting them down. If this strategy was successful, Russia could decide to attack the US early-warning satellites in response. In fact, the US intelligence community has warned that Russia is developing ground-based laser weapons for that exact purpose. But blinding US early-warning satellites would not simply undermine its ability to spot conventionally armed missiles. 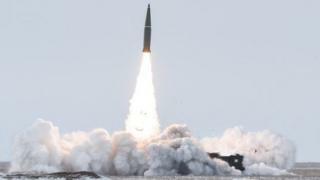 It would also compromise the ability of the US to detect nuclear-armed ballistic missiles and could raise fears that Russia was planning a nuclear attack on the US. Indeed, the latest US Nuclear Posture Review - the key official statement of US nuclear policy - explicitly threatens to consider the use of nuclear weapons against any state that attacks its nuclear command-and-control systems. This threat applies whether or not that state has used nuclear weapons first. The governments of nuclear-armed states are presumably aware of the growing entanglement between nuclear and non-nuclear weapons. They are also aware of at least some of the associated dangers. However, working to reduce these risks does not seem to be a priority. The focus remains on enhancing their military capabilities, to deter one another. One option could be for countries to try to agree a ban on weapons that could threaten nuclear command-and-control satellites. But for the moment, governments of nuclear-armed states are reluctant to sit around the same table. As a result, the prospects of such cooperation appear to be bleak. James Acton is a co-director of the Nuclear Policy Program at Carnegie Endowment for International Peace. This piece is based on Escalation through Entanglement: How the Vulnerability of Command-and-Control Systems Raises the Risks of an Inadvertent Nuclear War. You can follow him on Twitter here.